Iranian President Hassan Rouhani urged Parliament to approve four new ministers and help his government “resist” and “fight” the U.S. as it reinstates sanctions against the Islamic Republic. Rouhani’s comments came as lawmakers were discussing the vote for candidates vying for the ministries of Labor, Finance, Industry and Transportation. The U.S. has steadily restored sanctions on Iran following President Donald Trump’s withdrawal from the 2015 nuclear accord in May. Next month, the U.S. plans to impose sanctions on Iran’s oil and gas industry. Iran is already in the grip of an economic crisis, and has seen sporadic protests in recent months though Iranian officials have generally tried to downplay the sanctions and their effects. 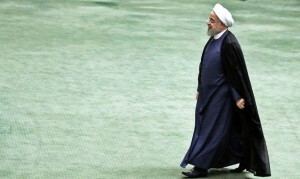 “We have problems that we must solve with each other’s help,” Rouhani told lawmakers. On Thursday, U.S. President Donald Trump vowed to do whatever it takes to pressure Iran to halt what he described as its “malign conduct,” referring to its alleged nuclear and missile development and support for terrorism and groups that destabilize the Middle East. Trump suggested he would be willing to hold talks with Iranian leaders, but that would be impossible without permission from the Iran’s Supreme Leader Ayatollah Ali Khamenei, who has the final say on all major policies. Earlier this month, the United Nations’ highest court ordered the U.S. to lift sanctions on Iran that affect imports of humanitarian goods and products and services linked to civil aviation safety.